Order select computers from Dell or HP on July 28, and they'll both guarantee delivery on July 29. While most PC makers aren’t rushing to ship Windows 10 computers, Dell and HP are catering to the impatient with guaranteed delivery on July 29. Dell.com is now offering a handful laptops and desktops with Windows 10 on board. Any orders placed before 3 p.m. Eastern time will ship today and arrive tomorrow in time for Windows 10’s official launch. 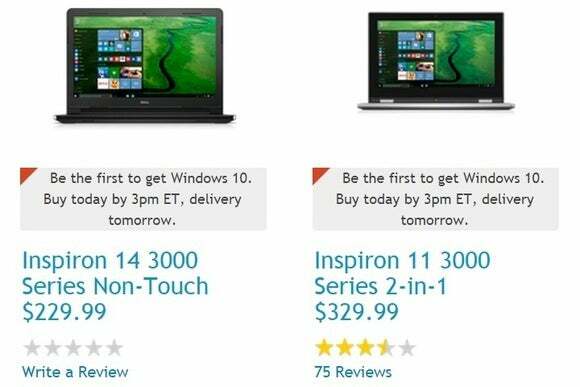 HP is running a similar promotion on its website, making good on an earlier promise not to miss the launch. Any orders that come in by 8 p.m. Eastern time will get free delivery on July 29. On the downside, both promotions cover just a small sampling of PCs from the two vendors. Dell’s sale includes 11 laptops and four desktops, but is missing the stellar XPS 13. HP’s selection is even smaller, with just five laptops and three desktops, though it does include a 22-inch all-in-one PC and the refreshingly bloatware-free Spectre x360 convertible. As Microsoft itself has noted, most other vendors and retailers are sticking with Windows 8.1 for now, with the ability to upgrade to Windows 10 for free after launch. Acer has said that it will start selling Windows 10 PCs on July 29 with early-August shipping, while Lenovo isn’t planning to ship computers with Windows to until mid-August. Why this matters: Windows 10 will be surprisingly hard to get on launch day. Microsoft is rolling out the update to existing PCs in waves as it tries to squeeze in as much compatibility testing and bug fixing as possible, while most PC vendors are taking extra time to test their hardware and pre-load their own software. Windows 10 is clearly coming in hot, and waiting for the dust to settle isn’t a bad idea, but at least you’ve got some options from Dell and HP if you want to be part of the launch festivities.